Shares of Kaveri Seed Co. Ltd gained 10% on Friday after a government panel on genetically modified Bt cotton recommended a steep reduction in royalty fees payable to seed technology companies. The committee has recommended a 70% reduction in royalty fees, which could see the maximum sale price of Bollgard II Bt cotton seeds fall from ₹ 830-1,100 per packet (the price varies across the country) to ₹ 800 per packet. If the royalty cut is implemented, domestic seed companies will benefit as they will pay a lower royalty fee and the price will be uniform across the states. Apart from Kaveri, shares of Rallis India Ltd, which also has a sizeable seeds business, closed higher last weekend. According to a domestic broking firm, the Ebitda (earnings before interest, taxes, depreciation and amortization) margins of seed companies will remain unchanged as a lower royalty will make good the reduction in the selling price. “We view this as positive as earlier concerns related to margins getting hit due to the intervention of the central government will subside," the broking firm said in a note to its clients. Further, the broking firm expects the reduction in the selling price to trigger consolidation as margins of smaller firms could get hit by lower economies of scale. Larger firms have an upper hand on this count, but lower royalty and seed rates will not be enough as the industry’s main problem is one of weak demand. In the current fiscal, the industry has been hit by low crop acreages, adverse weather conditions, crop losses due to pest attacks, subdued cotton prices and poor farmer sentiments. The seed price is not as relevant in this mixture. Despite reducing prices (by offering steep discounts), companies were unable to arrest the drop in sales. In the nine months to December 2015, Kaveri’s sales fell 24% from a year ago. Unless cotton prices recover drastically (already down one-fifth from January 2014), the scenario is unlike to change much. Cotton acreages are expected to remain at current low levels due to the shift in farmer preferences to other crops and inventory de-stocking in China, a major importer of cotton. “Ind-Ra (India Ratings) estimates that the cotton acreage will reduce to 12 million hectares in CY16 from 12.9 million hectares in CY15 and same in CY17. This will be due to the switching over of farmers to other competing crops such as guar, soya bean, groundnuts, pulses, etc., due to the better remuneration earned on them and the lower cotton prices," India Ratings and Research said in a note. “Unless there is a recovery of imports from China and other countries, and an increase in demand from domestic spinning mills, the acreage is likely to remain low." CY here refers to international cotton year, which is from August to July. 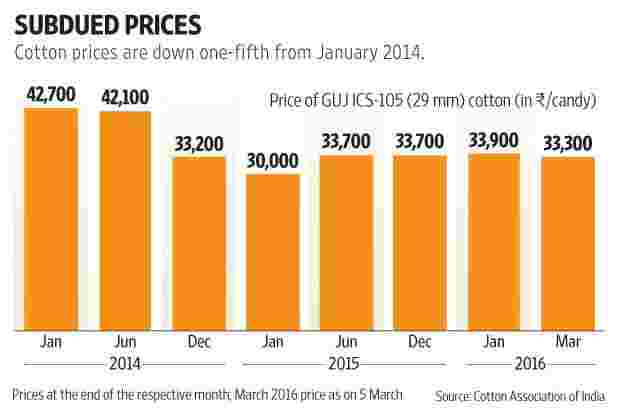 Low royalty and seed prices may ease the pain of cotton farmers somewhat but the bigger problem is one of low demand for their product.